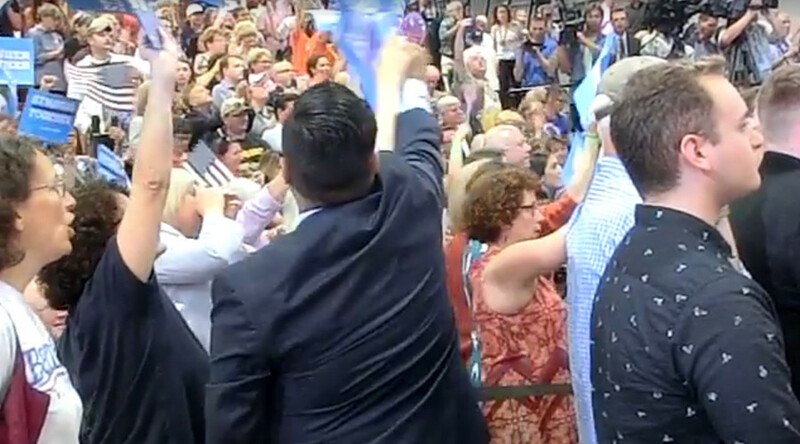 In an incident captured on video, a Bernie Sanders supporter attending the announced endorsement of Hillary Clinton in New Hampshire was jostled by a security guard every time she held aloft her “Bernie” sign. The account belongs to David Victor Feldman, an associate professor of mathematics at the University of New Hampshire. The post received over 569 likes or reactions, over 2,000 shares, and more than 90 comments by Wednesday evening. The almost 3-minute video opens with Sanders standing next to Hillary Clinton, stating, “[She] will be the next president” to huge applause. Off camera at the 23-second mark, a woman is heard yelling, “Stop that! Stop that!” which draws Clinton’s gaze in her direction. The camera swings back and to the left to show a man dressed in a suit, presumably a security guard. Off to his left are two women who look upset. As Sanders continues to speak, one of the women holds up her sign, which reads, “Bernie for president,” and it is clear the guard is trying to stop her from holding it up. After several attempts to stop the sign from being held up, the guard chases the woman around another supporter, repeatedly trying to grab the sign. In one grab, he succeeds in ripping off the corner of the sign but the Bernie supporter clings on and tenaciously continues to hold it up repeatedly in response to Sanders’ speech. The guard is then challenged by other Bernie supporters, though it is unclear what is being discussed. The guard then backs off the harassment, stands there, checks a message on his cell phone before a man in a blue shirt talks to him, and they move off screen together away from the Bernie supporters.